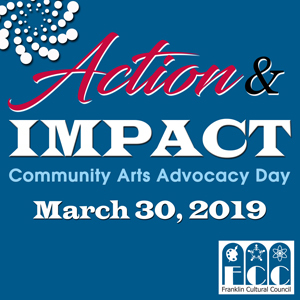 Franklin Matters: Register NOW for Community Arts Advocacy Day 2019! Register NOW for Community Arts Advocacy Day 2019! Join us for a FREE day of grassroots advocacy and arts management workshops for creative organizations. Action & IMPACT: Community Arts Advocacy Day 2019 is a multi-town event bringing together artists, art advocates, cultural organizations, and local businesses to participate in a day of grassroots activism and free arts management workshops.